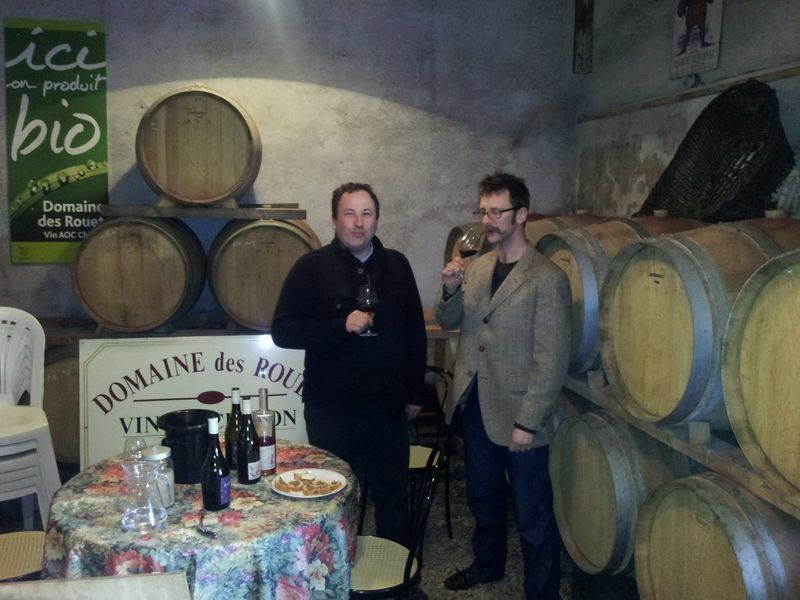 You may recall an earlier article where I was discussing the winemaker Jean-Luc Thunevin and his wines? Yesterday I had the pleasure of also meeting his new representative, Florian Brenot. 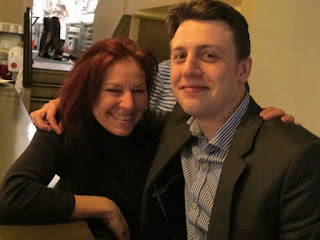 He was articulate and genuine, extremely knowledgeable about the wines with an amazing and discerning palate. Word is that he comes from very humble beginnings in France and met Jean-Luc Thunevin par chance (by accident!). Thunevin apparently saw something in him and hired him on the spot, sensing a good partnership. Two years later he is traveling with Thunevin wines internationally! Bravo! 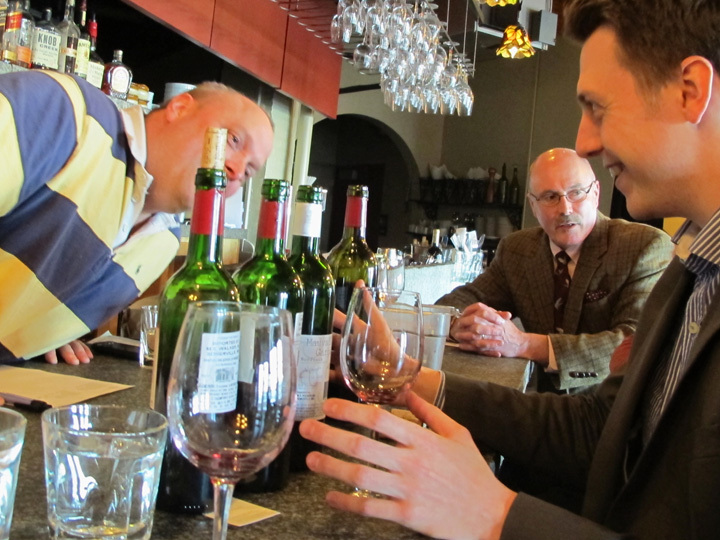 We were lucky to have him visit us here in Portland, bringing us closer to the world of wine in Saint-Emilion, France through tasting and hearing the stories of how they were created. 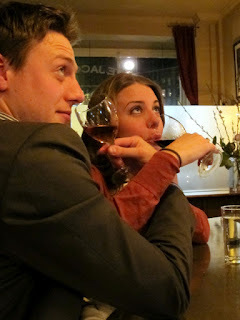 The wines were as elegant and complex as I recalled ... with luxurious mouth feel, subtle layers and much finesse. Wonderful fruit and spice, herbal and floral qualities as the case may be, all beautifully integrated. The terroir is truly apparent here ... black schist, limestone, sand, chalk to name a few. The Calvet Cuvee' Constance 2008 from Cotes du Roussillon has great depth, powerful fruit and elegance, with blueberry and dark cherry. Velvety. This is a huge mouthful that completely satisfies but doesn't make you full! Old vines. All organic. 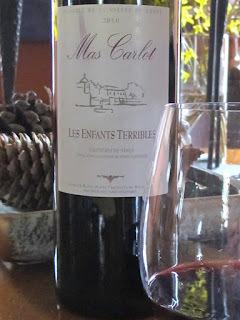 60% Grenache Noir, 30% Syrah, 10% Carignan. Sensual & delicious! Mauvais Garcon (Bad Boy) 2006 from Bordeaux has anise on the nose with deep bright and dark fruits such as plum and blackberry and a plenty of spice, pepper and earth. 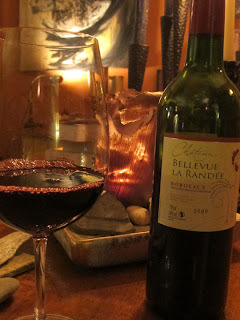 Subtle herbal qualities meander through, with a dry tannic finish. 12 months in new oak. Gutsy. This is 95% Merlot! 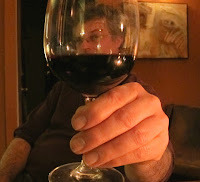 We thought we'd take Florian for a spin over to Petite Jacqueline (State St., Portland) for some sustenance and more wine! Here are Florian and Ali tasting a couple of gorgeous dessert wines ... a glass of Domaine La Tour Vielle Banyuls 2008 and a Chateau La Vaurie Peyraquey Sauterne 2003. Both delicious! 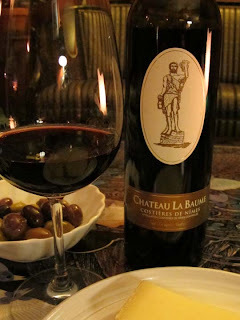 The Banyuls is an appellation hailing from the Eastern corner of France near the border of Spain. Garnet, black/purple in color with fig, currant, cherry & cranberries. Luscious! 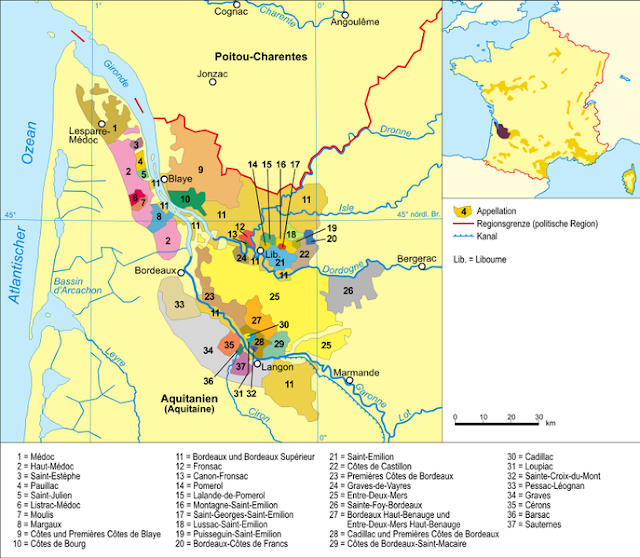 Sauterne, within the Graves district of Bordeaux region. This was a gorgeous salmon pink color with orange zest, caramel & cedre (cedar), Neither are overly sweet. Lovely! 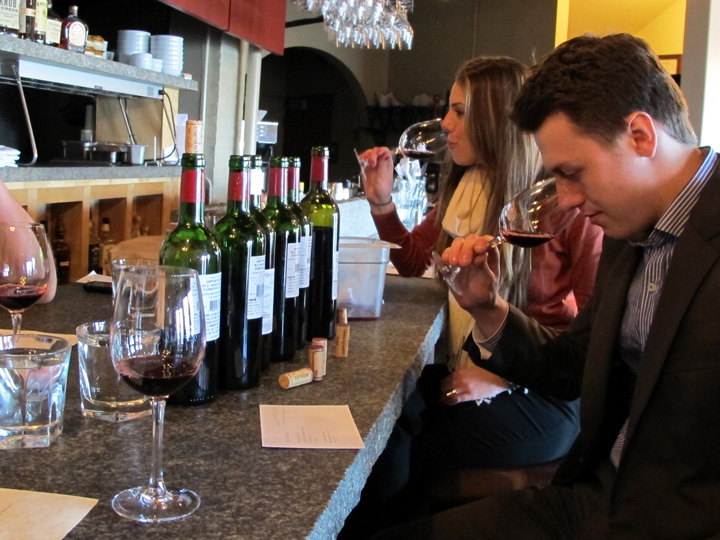 Thank you Florian ... we look forward to having you again and to enjoying many more wines from Jean-Luc Thunevin! So you may be wondering, where are the WHITE wines?! I know, it’s time, right? ... especially with this spring/summer-like weather we’ve been experiencing! Here we have a lovely white for such an occasion. Light straw gold in color, expressing a briny, saline quality on the nose, sipping this wine makes you feel like you’re sitting next to the ocean! 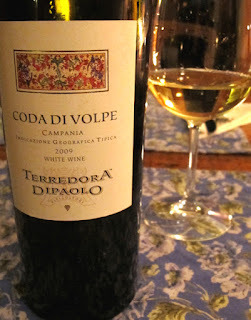 On the palate a touch of lemon meringue and citrus along with light mineral notes. It is clean and smooth with an elegant, harmonious finish. For food pairings think shellfish, fresh oysters on the half shell (unadorned), seafood, Caprese salad or a semi soft/creamy cheese like taleggi. Have a picnic! 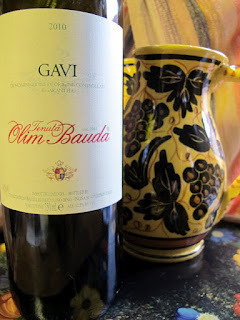 This wine is made from 100% Cortese, a grape found in Gavi, a DOCG area located in the Italian province of Asti, Piedmont near the Ligurian Coast and Italian Riviera. Lovely! So this is why one feels as if sitting near the sea. The wine is fermented and aged in stainless steel. $13.49 at the Munjoy Rosemont! In Portland at the Rosemont Markets & Vignola Restaurant; Tess’s Market, Brunswick; In Ellsworth at Cleonise; Francine’s in Camden; Wine Cellar in Rockland; Sawyer Specialty in Southwest Harbor; and the Lucerne Inn, between Bangor/Brewer on your way to Bar Harbor. How do you imagine we are lucky enough to have these wines available to us? You may or may not know that they come to us through a multi-tiered system of importers, suppliers and distributors, as well as those responsible for logistics and legal compliance. We have a dedicated group of wine folks working here locally every day to ensure that this flow of wine to us keeps happening. It’s an exciting and complex system that essentially begins with the “terroir” of a place (referring to soil and other unique climatic conditions that influence the quality of the wine), to winemakers, until it ends up here in our stores and restaurants. Let’s talk Europe. Let’s consider these three individuals who have either gone there recently, are in the process of being there, or getting ready to go ... to taste wines, meet with winemakers, visit the vineyards, even go to a huge wine expo. Tabitha Blake (front left in photo), principle/co-owner of CRUSH Distributors (along with John Naylor, Rosemont Market, 3rd from left) recently embarked on a trip to Wachau, Austria, exploring a myriad of winemakers - just under a dozen in fact! To name a few ... Anton Bauer is ranked among the top 10 Austrian white wine producers. We’re talking Grüner Veltliner and Riesling. For more info: http://www.antonbauer.at/video/movie2006.wmv. One of her other favorites is the Weingut Steininger DAC Grüner Veltliner from the family-run winery Steininger, situated in the wine growing village of Langenlois in the Kamptal Valley. Grüner Veltliner represents over 50% of their production and is expressed in different styles, from light summer wine to powerful, voluminous and full-bodied wines as well as dessert wines. She also loved the Tegernseerhof Zweigelt Rose’ from the Tegernseerhof/Mittelbach family, which they describe as “Strawberry and cherry fruits with lively acidity. Smooth and juicy with an amazing dry finish.” I can’t wait to try them for myself! There is much more to explore with what she found there. Stay tuned! Ned Swain (raising glass to taste), principle of Devenish Wines is currently (this week!) exploring some selected sites in the Loire region of France. 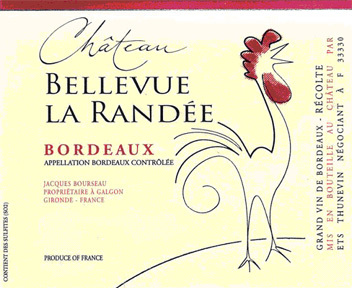 Here we are talking about mainly Cabernet Franc (red varietal) or Chenin Blanc (white varietal). 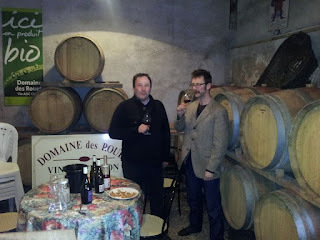 So far he has met with Jean Francois Rouet (pictured in photo to left), a sixth generation wine maker who farms biodynamically and Bernard Baudry (http://www.chinon.com/vignoble/Bernard-Baudry/ENG_default.aspx), considered to be one of the finest producers in Chinon. He also farms his vines in an environmentally friendly way, using no herbicides or chemical products. And grapes are hand harvested. The Devenish Manifesto states, “We believe wines should taste like where they come from —wines that in some way embody the unique climate and environment from which their grapes were produced. To that end, we seek out smaller family owned wineries that take pride in the wines they produce, grow their grapes more naturally, and have a real relationship with the land they work on. The wines we represent are the antithesis of industrially produced homogenized wines.” I for one, can’t wait to try some of the wines he brings back ... especially the Rose’s! I remember drinking a Chinon wine when in Paris and literally thought I’d died and gone to heaven! 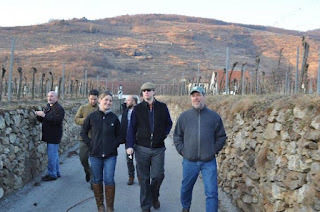 Michael Burke, sales representative for VIAS Imports (a small to mid-sized importer based out of New York, although he resides in Portland) travels this week to Italy to attend Vinitaly (a huge wine expo) and touch base with the winemakers and wines he currently represents. Vinitaly, is the largest wine show in the world, hosted by the beautiful city of Verona. Thousands of exhibitors are present, with thousands of wines to taste. Vine-growing, wine making, food & wine pairings, high cuisine and a myriad of wine connections. Slightly overwhelming?! We’ll have to wait and see where else his travels lead him this trip, but a couple of the producers of wine available to us that he represents include: Damilano in the Piedmont region or Terredora di Paolo down in Southern Italy’s Campania. In this case we’re talking varietals such as Arneis, Barbera, Fiano or Piedirosso as in the wine Lacryma Christi. Don’t worry ... I’ll break it down for you in coming articles. You’ll LOVE it! While the Devenish Manifesto articulated well the relationship between winemaker and purveyor of wines, this can equally be applied to both CRUSH Distributors and VIAS Imports. 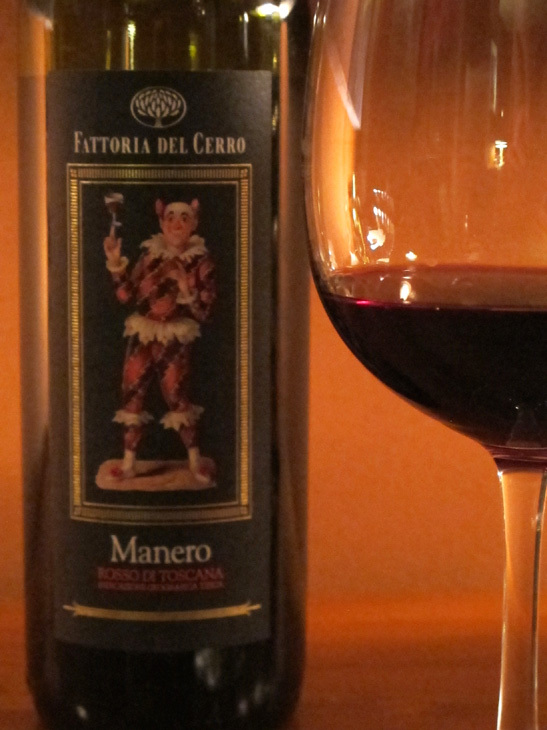 Rich red in color with undertones of burnt sienna, this wine is earthy, layered and sensual as first aromas arise. Subtle vanilla notes along with spicy hints of anise continue to please before even taking a first sip! While lush on the nose, it’s easy on the palate, with dark wild berries, plum and black tea. Later on the Sangiovese opens up, like the deeper notes of a viola or cello ... (I said to myself, as I was halfway through the bottle!) Dry, clean finish. A real crowd pleaser! 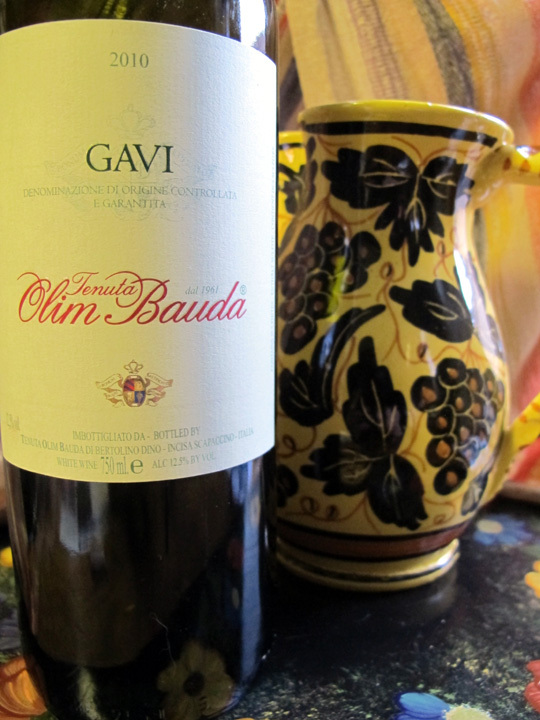 Pair with classic pasta and meat sauce, Osso Buco or antipasti of cured meats and aged cheeses. Another insane value at $10.99 a bottle! From Vias Imports through Pine State distributors, it can be found in the Portland, ME area at Rosemont Market – Munjoy Hill. Call Dan at: (207) 846-1234 for availability at Brighton & Yarmouth Rosemont locations. Whole Foods will feature a display of it this month. On the restaurant side ... also find it (believe it or not) at Cantina el Rayo, York St., Portland. Try it with the Burger. Enjoy!